… Perhaps I’m no match for it. I am a match that would like to ignite without being consumed. This is to introduce myself. I am young and I believe in magic. I am learning how to cast spells. My profession is transforming. I am what is known as an “artist.” Three years ago I made a discovery which caused me dis-ease at the time: neither the society in which I had grown up nor my society at that moment, my college, knew what to do with me. They were wary of me. I, suddenly without inheritance, began a three year adventure to seek the fortune of myself. This information is for professors wondering over an age of introspective art. Some say that no one has ever known what to do with the artist until after he is dead. Then his body is disposed of and his life works are buried in museums and libraries and, sometimes, in men’s minds. As over half of the culture professors of this and every college campus earn their living from picking the bones of the dead, it is hoped they will be interested in the flesh of their future. Make a place for the artist. Do it now. For you, as well as him, tomorrow is too late. First must come understanding, not of the work but of the worker. Give him the right conditions. Here are the conditions. This breed requires freedom. Cages kill him. Restrictions constrict. This animal is forever at war with his own limitations by nature. … I was, and am, alive with more curiosity than it would be possible for any man to satisfy in a lifetime. My most recent previous post from Brakhage’s book is here. … The writer who merely goes for meaning does nothing but calculate; he can only be said to write when all the senses tremble within the flesh of language, semi-soft, a double variety for sight, touch, smell and taste. The nine-string cithara is always to be found between wild animals and recitative, between death and knowledge. Our language — vowels, syntax and precision — must be bathed in music lest it die. The musical variety or layer flows or slips between us and the world, between us, within us. … Whatever sensation may have taught us, we know nothing about it. Take a black box. To its left, or before it, there is the world. To its right, or after it, travelling along certain circuits, there is what we call information. The energy of things goes in: disturbances of the air, shocks and vibrations, heat, alcohol or ether salts, photons … Information comes out, and even meaning. We do not always know where this box is located, nor how it alters what flows through it, nor which Sirens, Muses or Bacchantes are at work inside; it remains closed to us. However, we can say with certainty that beyond this threshold, both of ignorance and perception, energies are exchanged, on their usual scale, at the levels of the world, the group and cellular biochemistry; and that on the other side of this same threshold information appears: signals, figures, languages, meaning. … Place, space, volume and finally variety where energies move from one scale to another. … What we experience are virtual forces recombining, microperceptions shifting. Consciousness comes after the fact, when we realize we’ve lost our balance. … Create an instable body, an elastic stance. … “It is more difficult to stand than to move” (Feldenkrais). Standing still is a metastable activity: the stillness demands precise adaptation to the micromovements of a shifting equilibrium. To stand still you have to move. Everyone sways. You may think you’re standing still, but actually you’re drifting, shifting slightly to the left, your ankle twitching as your weight moves to the ball of your foot, your knee bending slightly as you take in a breath. As Bruce Schechter noted after trying to measure the stillness of people standing: “It doesn’t matter whether you are feeble or fit, the fact is you have never stood stock still in your life.” Standing still requires constant correction. These are not conscious corrections. They are virtual micromovements that move through the feeling of standing still. … Why does it feel so punitive? Perhaps because we think we should not move. Because we believe we should have the capacity to stop. But we can’t. And so we move, and we try to hide that moving by ignoring the movement moving. But the more we ignore the movement within stillness, the more we lose our balance. To be balanced is in fact to move with micromovements moving. In Feldenkrais’s terms, it is to become aware of how our special characteristic moves-with our body moving. “All species of animals have a characteristic form of posture, which usually we think of as standing, although dynamically this is the configuration of the body from which any act is made.” Dynamically speaking, we can still standing. As long as we keep moving through posture. Moving through movement stilling means dancing posture’s small dance. A posture is a quality of movement stilling that inflects moving. The strange thing about posture is that you can only alter it from within a movement moving. If you try to stop the movement, you don’t get a single posture, you get a multitude of micropostures that move in tandem with the rejigging of micromovements. Stopping is virtually impossible. … When we move, we move around the posture’s quasi-chaotic center. It is quasi-chaotic because it contains in their incipiency all the tendencies for reconfiguration of a movement moving. The most frequent movement for which a standing body prepares itself is a movement around. This turning around the spinal axis will generally revolve around a whole body moving. If the head turns, the shoulders will follow, and then the hips, the knees, the feet. This seemingly organic movement can take many surprising forms. Anywhere along the way, the incipient nextness can be dislodged, and the movement’s equilibrium can be altered. …Standing still makes felt the incipient force of micromovements reconfiguring the body’s stilling. Since we’re not so busy getting somewhere, we can feel our movement moving still. The feeling of losing our balance is amplified by the quietening of the reconfiguration. This is not yet consciousness of a movement. What we experience are virtual forces recombining, microperceptions shifting. Consciousness comes after the fact, when we realize we’ve lost our balance. A shift in space-time makes us aware of the displacement. We know what we’ve felt when we are no longer in the feeling. … “Consciousness flickers, and even at its brightest, there is a small focal region of clear illumination, and a large penumbral region of experience which tells of intense experience in dim apprehension” (Whitehead). … Consciousness is of the pain, and of the lack of pain. Consciousness is how the irradiation of experience gathers itself into a final form. This final form is not the experience as a whole. It is what Whitehead calls the acme of emphasis. Standing still foregrounds the quality of the activity in relation of micromovements necessary in the stilling of the body’s temptation to lose its balance. Losing balance is the quickest way to get moving. Find the balance moving, and move with the imbalance as it corrects itself. Feel the quality of the movement, its tendencies, its potential directionalities. Create an instable body, an elastic stance. Be aware of movement coursing through stillness. Feel the dynamism of the force of movement beginning to take form. Call this incipient action. … The surreal is not a region, is not situated: not in the real or above the real, above reason in unreason or beneath consciousness in the unconscious; nor is it the reconciliation always still to come of these irreconcilable possibilities. The surreal may well seek to constitute for itself imaginary objects, indicate itself in the margins, discover itself close to the unwonted through what is stunning and fascinating. These indications still have no more than a distancing value: reminders of the unseemly whose law is not only to disorder the order of the appropriate, but also to be unable to suit itself, concern itself, or conform to itself by assuming a form. The non-coinciding, the non-concerning — these are indeed what cause the surreal radically to change the meaning of what we have called the experience in which it is in play, not only separating it from all empiricism, but leading it to touch on everything at once: life, knowledge, thought, speech, love, time, society, and the whole itself; putting everything in question (ejecting the whole from the order of the whole) not by a stormy tumult or a purely capricious negation, but through this concerted, non-concerted seeking that remains without assurance and without guarantee since it aims at the other that is always other. … The problem is, in a sense, not the indirection of the music but the misdirection of the listening. … Samba is a polymeter, layered over a 2/4 structure. But the strong syncopation is suspended, the weak accentuated. The suspension leaves the body with a hunger that can only be satisfied by filling the silence with motion. Samba, the dance, cannot exist without the suppression of a strong beat. Polymeter is a manner of describing rhythmic structures which combine various ways of counting. It is the dominant mode of all Pan-African music, and it is what distinguishes this music from Western forms in which harmonic and melodic progression predominate. A person schooled in the European musical tradition may, on encountering a polymeter, find it either incomprehensibly complex, or may apprehend a surface texture which seems not to go anywhere — hence the complaint of monotony. The problem is, in a sense, not the indirection of the music but the misdirection of the listening. The interest of harmonic/melodic music is in its pattern across time: the way the line varies, or harmonies change. The interest of polymetric music is in the simultaneous patterns which are established in a single measure. One reads Western music, on the page, from left to right. If polymetric music is notated, one must read it vertically in order to perceive its complexity. This is not to say that it doesn’t change over time. In fact, the breaks in rhythmic structure, the ruptures in the pattern, are the points at which the full complexity of the original pattern becomes evident. But the break precisely points out all that is inherent or potential in the texture before the tear. … On each step marked b-h (ball-heel), the weight of the body is pitched slightly forward, while the next two steps (ball-ball) are a mere lifting up and back in preparation for the next pitch forward. The dance that I have inscribed here is a simple version in which the pitching-forward occurs on the initial beat. A funkier version of the step would pitch forward rather on the second beat of each set of triplets. That is a recomplication of the rhythm which most Western students find more difficult, although it is merely a resituation of the same step within the rhythmic structure — another dislocation of the downbeat. If you are reading this chapter hoping to learn the dance, this is the moment at which you will shake your head in exasperation. It will only make things worse if I tell you that while all this is happening, the hips — particularly if you are a woman — must lag slightly behind the feet such that their triplet, while it follows the same right-left-right pattern, will accentuate or weight a beat slightly after that of the feet, while your shoulders (strange quietude over this cacophony) will simply roll on the one and two of the third line of my original notation. I have taught Brazilian dance for years, and if ever I had prefaced a class with this description I would have lost even the most agile of my students. Western students of polymetric music and dance often request that the rhythms be broken down, but a complete breakdown results in just that — the rhythm breaks down. Our frequent admonition — stop thinking and dance — isn’t to say that the motion is unthinkable. It’s to say that the body is capable of understanding more things at once than can be articulated by language. One has no choice but to think with the body. … I said that samba is layered on a 2/4 structure. In the notation, that fundamental beat can be read in the third line. In the instrumentation of a modern samba band, the fundamental 2/4 beat is played by an instrument called the surdo, an enormous bass drum which is strapped over the shoulder. Surdo, which means “deaf” in Portuguese, can be understood as referring to the effect of the deep pounding on the player or the listener. But it might also be understood as the quality of sound produced by the drum. The surdo is so extremely deep in tone, so very bass, that its effect is like a negative utterance. It seems in a sense to erase or negate that moment in sound. Samba as a rhythm not only suspends its downbeat through the clave, but even in its stressing of that beat blacks it out. The accompanying dance can fill the gap with a strong step or can reinforce its dislocation with another kind of suspension. But marking the absence of the downbeat is another way of indicating it. However the samba is danced, it is the suspension or silencing of a beat which provokes movement. … the convenience of calculating machines seems to be leading to the rapid adoption of a single language and method. … starting from scratch, without literary tradition altogether, writing and reading are imbecile and trivial; ancient errors are tiresomely repeated; platitudes are taken for ideas; hard won distinctions are lost; useful genres have to be reinvented, like reinventing shoes or learning to boil water. Unencumbered by history, when the young are discussing their immediate real problems, for instance, the [military] draft, their rapping is fresh, direct, accurate, and inventive, excellently literary. When they are discussing politics, the institutions, or the professions, they become abstract and brassy. When the task is critical judgment or poetic affirmation of their own experience, they are embarrassed and inarticulate or full of clichés. … The most dangerous threat to humane letters at present … is not the ugliness and commercialism of corporate capitalism, nor the ignorance and alienation of the young, nor the hypocrisy or censorship of power. It is the same dehumanization of Modern Times that I have been discussing throughout this paper. Language is reduced to be a technology of social engineering, with a barren conception of science and technology and a collectivist conception of community. … In this tendency, communication is taken to be the transfer of information from one brain to another, and all the rest, the expression, is noise or meaningless emotion. Linguistics construct grammars of basic vocabularies of “factual” words connected by Russell’s logic of relations to provide a pidgin for transferring information, or to allow for computer translation. These are useful purposes, but they are not what language, or English, is. In my opinion, speaking is an action and passion of speaking animals, directly affected by their speech encounter; the style of speaking is how the speaker has his information and is with the others, so it is intrinsic to the meaning. In most conversation, the non-informational part is by far the greater; a grammar of English should be drawn from common speech and the heightened speech that has proved interesting, literature. I doubt that there is a general basic vocabulary. What is “fact” depends on how one is in the kind of world one has. … now Science is taken to be a central office in which new data are added, new theory is processed,and new projects are launched; and the convenience of calculating machines seems to be leading to the rapid adoption of a single language and method. To my lay understanding, this implies — doesn’t it? — a likelihood of misinterpreting what cannot be easily said in the one language, and disregarding what cannot be coped with by the one method. … It is the sign of an ignorant man, said Aristotle, to be more precise than the subject allows. There is more communication in a poem of Keats than in a scientific report, said Norbert Wiener, for the poem alters the code, whereas the report merely repeats it and increases the noise. … By presenting soldiers with the horrors of war before they set off to fight, Dr Rizzo hopes to inure squaddies to anything they might witness on the field of battle. … The virtual training course Dr Rizzo and his team have developed leads soldiers through a tour of duty that includes seeing and handling human remains, experiencing the death of virtual comrades to whom they have become emotionally close, and watching helplessly as a child dies. Unlike a real battlefield, though, a virtual one can be frozen, and events occurring there discussed at leisure. When that happens, a virtual mentor emerges from the midst of the chaos to guide the user through stress-reduction tactics he can deploy. It’s a good idea to desensitize people to the suffering of others? And what kind of people will these be after they complete their military service? Read the article — and the reader comments if you’re interested. … It is seamless, without gaps, and depends not on quantity and the amassing of discrete units such as words or numbers but on shapes, forms and textures — patterns, in fact — and patterns, of course, are built of relationships. … If, as I have suggested, musicking is an activity by means of which we bring into existence a set of relationships that model the relationships of our world, not as they are but as we would wish them to be, and if through musicking we learn about and explore those relationships, we affirm them to ourselves and anyone else who may be paying attention, and we celebrate them, then musicking is in fact a way of knowing our world — not that pre-given physical world, divorced from human experience, that modern science claims to know but the experiential world of relationships in all its complexity — and in knowing it, we learn how to live well in it. … What form does the information take that ties together the living world? The answer Bateson offers is that the information that is given and received by living beings is always what he calls “news of difference,” whether it be a static difference between figure and ground as the creature scans it or a dynamic change over time. … whatever the mechanism may be that binds the various sensory stimuli into a single unified experience, image formation is an active and creative process, not mere passive reception of whatever stimuli are being presented. This is probably true, in one way or another, throughout the living world. The creature, however simple or complex it may be, works on the stimulus, the news of difference, and creates meaning from it. Even an amoeba needs to find something analogous to what we call meaning in, say, the presence of certain substances in the drop of water in which it lives in order to move toward the creature that is their source and engulf it. No information can be received unless the creature is ready to receive the raw stimuli and transform them. The receiver creates the context in which the message has meaning, and without that context there can be no communication and no meaning. … Verbal language is discontinuous, whereas the world is continuous. Relationships also are continuous and do not lend themselves to one-thing-at-a-time description. We have to take them all in one piece in all their complexity, and it is here that verbal languages really show their limitations. One thing at a time is just too slow and cumbersome to deal with their many-layered quicksilver nature, and when we try to articulate them in words we keep falling into the gap between description and reality. The gestural language of biological communication, on the other hand, is continuous, as are relationships themselves, and for this reason it is much better suited to their articulation. It resists all attempts to dissect out, in parallel with verbal language, a specific vocabulary of gestures, whether visible or audible or even smellable, tastable or touchable. It has no vocabulary, no units of meaning. It is seamless, without gaps, and depends not on quantity and the amassing of discrete units such as words or numbers but on shapes, forms and textures — patterns, in fact — and patterns, of course, are built of relationships. … The languages of bodily posture, movement and gesture, of facial expression and of vocal intonation continue to perform functions in human life that words cannot, and where they function most specifically is in the articulation and exploration of relationships. While among simpler creatures the conventions of paralanguage [= the gestural language of biological communication] are determined entirely or mainly by instinct — which is to say, they come with the genes, hard-wired — the greater degree of flexibility that we have already noted among more complex animals, most especially the primates, means that the conventions have to be learned, not just once and for all but throughout the life of each individual. … The communicative gesture, freed from the immediate and possibly life-and-death situation under the privileged conditions of play, has acquired a perhaps less urgent, but no less important, role as discourse, as a way of articulating and exploring relationships, of trying them on to see how they fit, not only among humans but also between humans and the larger pattern that connects. The function of the discourse is the same as it has always been, but the ancient gestures of relationship have been elaborated over the million-year history of the human race into the complex patterns of communicative gesture that we call ritual. My most recent previous post from Small’s book is here. itself ornament the weave of presence. … As Leonardo did not confine the scene to a single scale, nor to one temporal moment, so the gestures ambiguate. … A stupendous drawing, Windsor 12547, preserves Leonardo’s thought for the features of Judas. The face is averted. But more ominous than the lost profile is the snarl of vein, muscle, and sinew that excoriates the neck like an écorché’s, as if already postmortem, anatomized. The neck of a man who will hang before the night’s end. Judas’ recoiling grasp is not reducible to a single narrative present. Though he seems stopped at the moment of accusation, he does not actually dip in the dish, and his forward hand cannot — and did not for Rubens — exclude the transgression of unworthily receiving the eucharist. St. Paul writes: “Whosoever shall eat of this bread and drink this cup of the Lord unworthily shall be guilty of the body and blood of the Lord.” In Rubens‘ reading of the Cenacolo, the terms of the equation reverse: he who is guilty of the Lord’s blood is partaking unworthily. … What the Judas face in the mural was believed to express was consensually predetermined. The older Cenacolo literature finds the face Leonardo would have given to the betrayer expressive of bottomless evil, a compound of slyness, hypocrisy, thievish greed, ungodly defiance. All this to describe the aspect of Judas on a patch of wall where no vestige of Leonardo’s brush has survived. The restoration by Giuseppe Mazza in 1770 is known to have produced a new Judas, and the cleansing of the 1990s, though it claims to reveal authentic Vincian underpaint at the other faces, admits that the betrayer’s head had to be done up from scratch, led on by the best early copies. How closely these copies reflect Leonardo’s final conception of Judas we’ll never know. 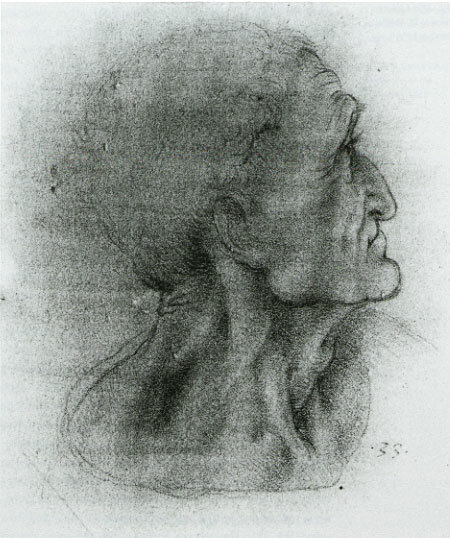 … Leonardo’s initial rendering of the betrayer [as sketched in the Windsor drawing] tracks inner conflict; lips clenched under enchanted eyes that gaze on their gift of light, and the brows upped almost beyond a forehead’s endurance. This brow takes its shape from a spasm — which the copies read as a structural malformation, a misshapen crag. On the face of the ultimate sinner Leonardo’s drawing did not stamp ready-made execration, as one might on the devil’s snout. To the agon, the wretchedness of a man who had once been chosen by Jesus — whom Satan entered on cue (John 13:27), but whose nature, having experienced devotion, retains its capacity for remorse — Leonardo brought a tragic vision far in advance of what his contemporaries could fathom. The subjective experience of abjection never received more humane understanding. … within the balanced asymmetry of the grouping, the themes of the Supper suffuse one another. As Leonardo did not confine the scene to a single scale, nor to one temporal moment, so the gestures ambiguate. My most recent previous post from Steinberg’s book is here.